East Coast Transport, LLC, a mid-size third-party logistics provider, has selected the automated Load Track platform from Trucker Tools and plans to extend its use of the technology beyond real-time freight visibility. East Coast Transport (ECT), based in Paulsboro, N.J., serves some of the largest shippers in the United States. The company is celebrating its 40th year as a woman-owned minority with additional offices in Baltimore, Md., Philadelphia, Pa., Fayetteville, Ark., and Palm Beach Gardens, Fla.
ECT specializes in refrigerated transportation and meeting strict customer requirements for tracking and monitoring loads to ensure food safety. In July, the company selected the cloud-based Load Track platform from Trucker Tools after testing and evaluating different product options. The more frequent location updates and precise tracking methods of Load Track stand out from other freight tracking products in the market, said Paul Berman, vice president of logistics at ECT. Berman has over 40 years of experience in transportation of time- and temperature-sensitive products. 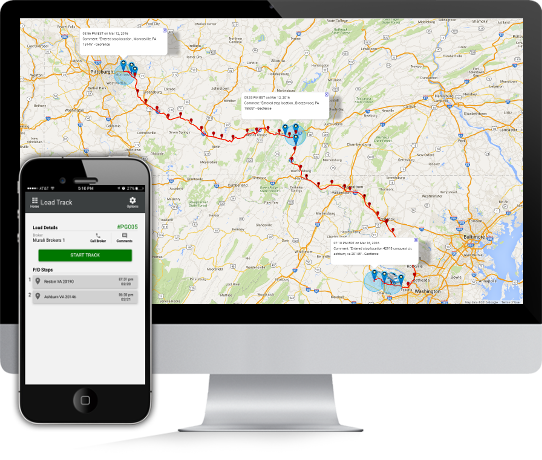 Load Track is embedded in the free Trucker Tools smartphone app and captures real-time shipment locations using the GPS on drivers’ phones. The integrated freight tracking process begins when a driver is dispatched to pick up a load and continues, uninterrupted, to the final delivery. Besides eliminating manual “check calls” with drivers and providing customers with accurate supply chain visibility, East Coast Transport plans to use a new product that Trucker Tools is developing to find capacity faster and more efficiently than ever before. Independent freight agents are a segment of the market where Trucker Tools says it is seeing increased demand for its Load Track platform. This future product roadmap of Trucker Tools was a deciding factor in the selection process, Berman said. “It was important for us to find a technology partner with the application, product support and people we knew would have a future with us in transportation. No one else I spoke to about freight tracking technology has the vision and capabilities that Trucker Tools has,” he said.